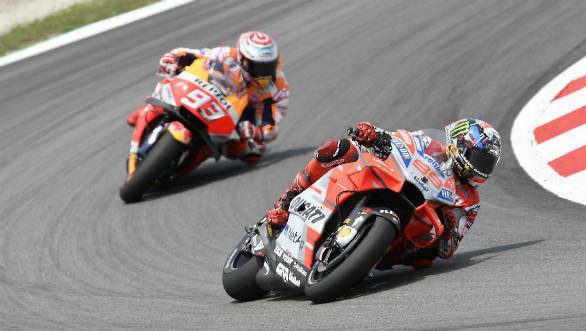 Jorge Lorenzo, racing for the factory Ducati team emerged victorious at the Gran Premi Monster Energy de Catalunya in Spain, fending off a stiff challenge from Repsol Honda's Marc Marquez. 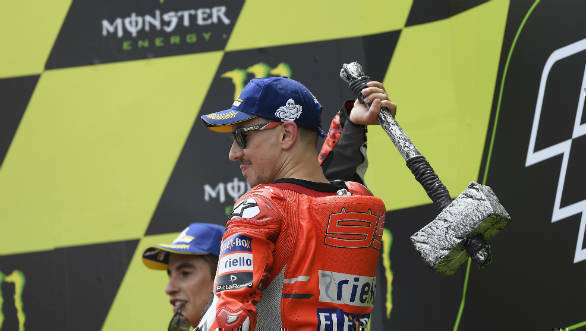 This is Lorenzo's second win on the factory Ducati, after winning the previous round in Mugello, Italy. Lorenzo started on pole position with Marquez and teammate Andrea Dovizio on P3. As the lights went out, Marquez made a brilliant start and snatched the lead from Lorenzo who struggled to get off the line quickly. Lorenzo also came under pressure from factory Suzuki rider Andrea Ianone and was relegated to third position on the opening lap. The Spaniard kept his cool and managed to keep his cool and overtake Ianone and Marquez on the next lap . From then on, it was hammer time as Lorenzo put in one scorching lap after another. Marquez looked threatening for a few laps but couldn't do anything about Lorenzo's sheer pace on the Ducati. In the end, Jorge Lorenzo crossed the finish line, 4.479s clear of Marquez. Movistar Yamaha's Valentino Rossi, who started from Row Three, moved up the order quickly aboard his YZR-M1 and joined the leading pack of Lorenzo, Marquez and Dovizio. Running in fourth he looked certain of a strong finish. On Lap 9, Dovizio crashed, promoting Rossi to third, the Italian eventually finishing the race in the same position. 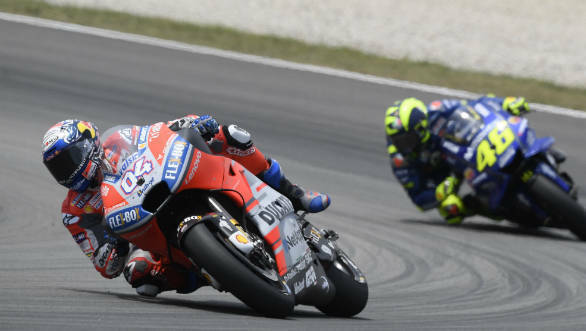 Marc Marquez continues to lead the 2018 MotoGP World Championship with a 27 point lead over Valentino Rossi. The next race will be held at the TT Circuit Assen. Stay tuned for live Twitter updates and the race report.